Elasto Proxy, global supplier of specialty seals and custom insulation, is announcing a technical article about its 3D CAD capabilities for the predictive modeling of rubber components. By simulating gasket compression, analyzing the effects of different pressures on door seals, and modeling the deformation of rubber profiles, Elasto Proxy helps to ensure part quality while saving time and money. Instead of fabricating a rubber part, testing it in the field, and then addressing problems across multiple iterations, designers can simulate part performance in a virtual environment. Elasto Proxy, leading supplier of custom seals and specialty insulation, is announcing a new technical article about its three-dimensional (3D) computer-aided design (CAD) capabilities for seal simulation. As the new article explains, the custom fabrication specialists are using SolidWorks® to design rubber parts and predict seal performance under variable conditions. Instead of fabricating a rubber part, testing it in the field, and then addressing problems across multiple iterations, Elasto Proxy's seal designers are simulating part performance in a virtual environment. 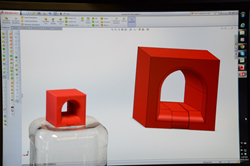 Without incurring material or production costs then, the company is now using SolidWorks to design and test parts such as door seals, gaskets, and rubber profiles. As Elasto Proxy's technical article explains, its SolidWorks capabilities strengthen the custom fabricator's already robust technical design and custom fabrication capabilities. Many product designers already use CAD software, but not all CAD programs offer the seal simulation capabilities that Elasto Proxy now provides. Elasto Proxy is also announcing that, because SolidWorks accepts various file formats, the company can accept a partner’s existing digitized designs. Alternatively, the sealing specialists can work with drawings or blueprints, and enter numeric parameters directly into the application. For more information about how the company is using seal simulation software to save partners time and money, contact Elasto Proxy today. Elasto Proxy designs and custom fabricates specialty seals, thermal and acoustic insulation, vibration dampening products and materials, EMI shielding, and other high-quality rubber and plastic parts. By listening to all of your requirements and analyzing all of your needs, Elasto Proxy’s solutions providers can recommend sealing solutions that are right for your application. How can we help you?